On day 3 of the hike which was the longest day of walking. We started out going up, up, up and then were level for a few hours – we were level because we were basically at the top of a darn mountain! I couldn’t believe that we basically climbed a mountain! We were so high up, we were in the clouds! It was so beautiful and we all just kept saying to each other – it’s amazing, it’s incredible. And those words aren’t actually adequate to describe how beautiful it was up there. After a few hours of walking along the top of the mountain, we started heading down. And down. And down. We got to a point about an hour from camp and were given the choice to go directly to camp, as it was starting to get dusky, or we could go to the ruins at Winay Wayna. A group of us opted for the ruins and I’m so glad I went. The sun was setting and there were no other people at the site, just 9 of us and a bunch of llamas (there were llamas everywhere). It was so peaceful and restful. We sat for a bit and chatted about the fact that the next day, we’d actually be arriving at Machu Picchu! We didn’t make our way in to camp until after dark (we had to use our headlamps to make it! ), and just had dinner and headed off to bed – we were getting up at 3:30 the next morning!! After being awakened at 3:30 and having a quick breakfast at 4, we headed over the guard post where we had to check in one final time before heading off the Sun Gate. The gate opens at 5:30, but because the camp at Winay Wayna is the last outpost before this gate, it’s where all the hiking tour groups camp the last night, which is why we had to get in line early. We weren’t too far from the entrance, so once it opened at 5:30, we didn’t have to wait too long to head out for the morning. We had about an hour of walking ahead of us to get to the Sun Gate. It was mostly level, thank goodness – probably was the easiest part of the whole trek! When we got to the Sun Gate, we took more pictures and took a little break (we were all a bit hungry after having had breakfast about 3 hours prior). Once we got the Sun Gate, we still had another hour to go before we actually got to Machu Picchu! 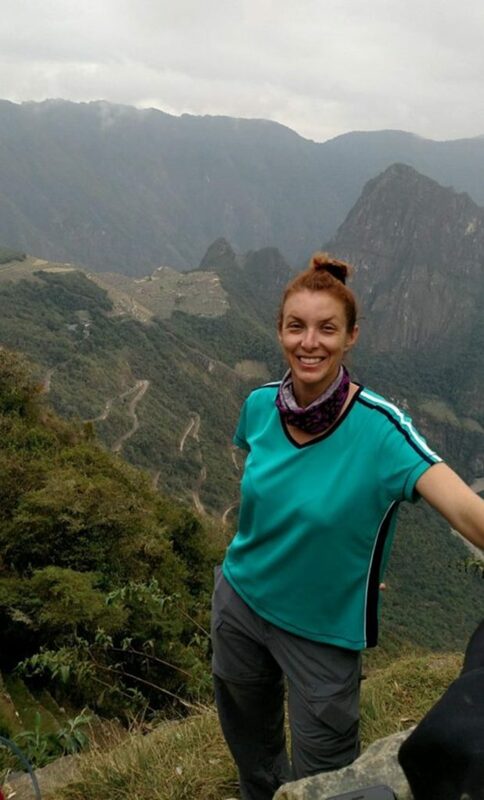 As we were heading down, people who had taken the ‘lazy train’ (i.e., the tourists that didn’t hike the trek and took the train to Machu Picchu) were headed the opposite way to see the Sun Gate. It’s funny – I didn’t notice how bedraggled we were until we started passing these people that were in nice, clean clothes with makeup and jewelry on! And you could smell how clean they were when they passed by! That was when I really realized how dirty and smelly we were. But it’s funny – it was like a badge of honor. And some of the folks who passed us knew that we had hiked the trail and congratulated us. That was when I really started feeling proud of just what we had accomplished. We got to spend 2 – 3 hours exploring Machu Picchu before catching the bus down to the town of Agua Calientes where we had a nice lunch. I even tried alpaca steak (which is another local Peruvian dish). Then we took the train back to Ollantaytambo. The train ride was somewhat surreal – it felt weird to not be walking! – and we were surrounded by regular, CLEAN people. Once we got back to the hotel in Cuzco, we all took showers (lukewarm water – we were all showering at the same time!) and then 8 of us met up for one final dinner – we went to a very nice steak house that Rohody recommended. It was such a lovely evening, even though we were so tired, we didn’t get back to the hotel until after 11! The trek was very hard, but it was amazing the entire way. I was with a wonderful group – we all supported each other the entire trek – friends for life, for sure! 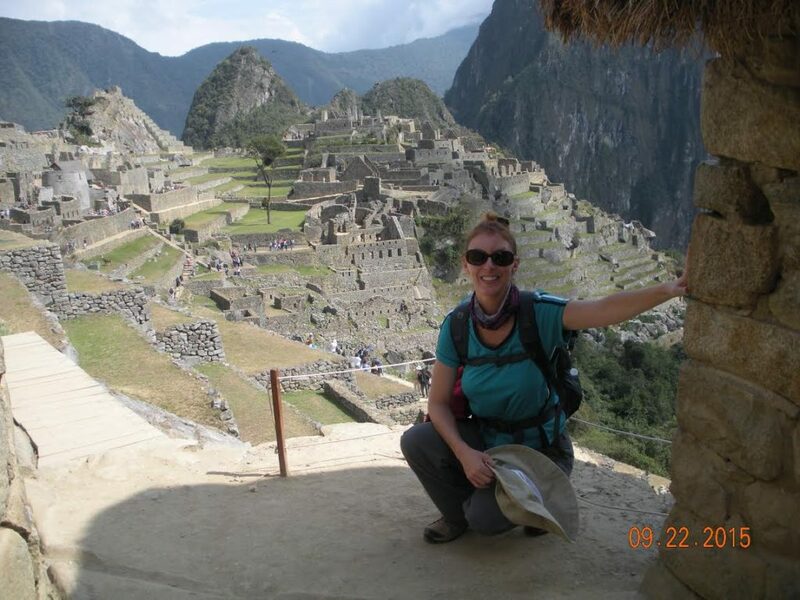 And there are no words to describe Machu Picchu – it was the most amazing thing I’ve ever seen. It was a trip I will never forget! !